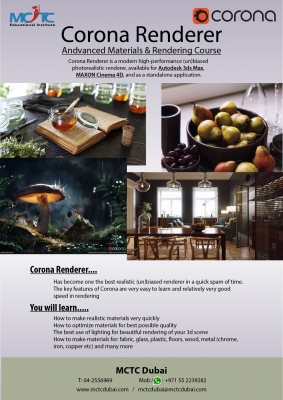 Corona renderer is a photorealistic ray tracer, used by computer graphic artists for the final frame production rendering mainly for architectural and product visualizations. The last couple of years they attracted thousands of users, and a lot of attention in the architectural visualization industry. So that is the reason why we want to take a closer look and spot some light on the capabilities and the workflow when it comes to rendering architecture visualizations with 3DS MAX and the Corona render engine. Main advantages of Corona are simplicity and usability, namely how easy is the software to use in practice and how this fact increases artist’s satisfaction and performance. Maybe Corona is not the fastest, most physical, or most feature-complete renderer on the market, but clearly is one of the simplest one to work with – which is pretty important for a lot of architects and designer who need to apply new technologies quickly to their workflow. MCTC Dubai offers a variety of new and trendy professional courses since 2006. We have proven years of experience in both individual and corporate training. Free demo available for all the courses. Our professional experts will explain you and train you from the scratch to advanced level. Register with us and become an expert in a short period of time!